Great idea no. 1: pull a quill, dip it in ink, and write on parchment. The idea lasted about a thousand years. Great idea no. 2: figure out how the ink can be contained within the pen. After a century or so of experimentation, mass production of fountain pens began in the 1880s. Great idea no. 3: the ballpoint pen goes on sale in 1945. Almost great idea no. 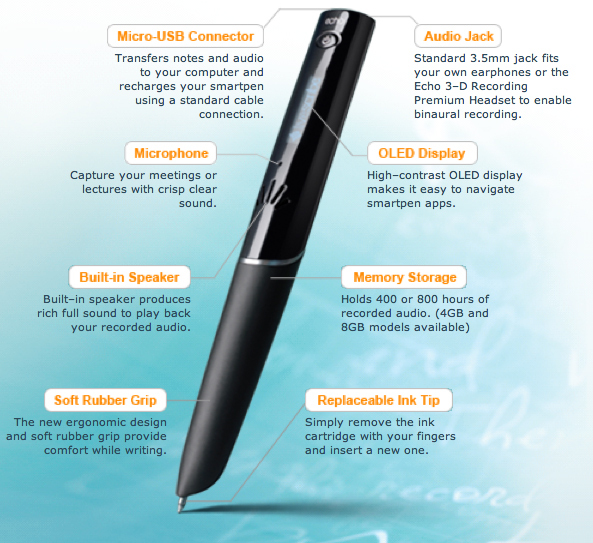 4: LiveScribe, a pen that remembers what you wrote, when you wrote it. LiveScribe is, in fact, the brand name for several smart pens. The one I tried called is the Echo. Several Echo models are available for about $125-250; the difference between them is the amount of internal memory. As you can see from the layout below, the pen records and stores up to 800 hours of audio, writes in ink, contains a small microphone and loudspeaker, and connects to your computer via USB for downloads and for charging. That’s half the story. The other half of the story is the special paper required by the pen. It’s a tiny matrix of dots imprinted on “LiveScribe Dot Paper” available as notepads, sticky notes, journals, notebooks, sticky notes–you can even print the special paper on any laser printer. I think the notebooks are best–and I believe it is wise to invest in LiveScribe’s $25 Portfolio to keep both the pen and the notebook in a single binder so that neither strays far from the other. Both are required for LiveScribe to do its magic. The Echo has an on/off button. When flipped on, I see the time and the remaining battery power. In the notebook, I find the crossed arrow and click on its center point. This causes the pen’s display to read (and the pen’s internal voice to say) “Main Menu.” Then, I choose another icon (located on every notebook 2-page spread) labelled “Record” and we’re off. The pen records audio and it also remembers what was written, by time. Press “Play” and you hear the recording. Click anywhere in your notebook’s written text and the pen will tell you when the text was written by day and date. There are other features–and more coming as LiveScribe develops this ingenious device not only as a pen but as a portable computing platform. You can draw a small piano and play it with your pen. You can adjust date and time, configure for left or right-handed writing, adjust playback speed, calculate (there’s a printed calculator on the inside front cover of the notebook–the result appears on the pen’s display). One more term that LiveScribe has begun to popularize: “PenCast.” That is: you write and draw with the pen, narrate your work, then package it up for viewing. It’s a bit like a traditional presentation, a bit like a conversation around a whiteboard, and it’s quite effective. Sending the pen’s contents to your computer requires the installation of some free software as well as Adobe AIR, which is also free. Although free, the connection process is not intuitive. Here’s where the teeny screen on the pen becomes awkward, and the lack of printed “Connect to…” commands on the notebook pages results in a tedious exercise. If you don’t use the LiveScribe pen regularly, it’s very easy to forget how to send notes to email, Evernote, your desktop, etc. And when you do, the result is not an audio-visual file, but just a pdf (without the audio accompaniment). To get both, you must produce a PenCast–not hard to do, but again, you must remember the special particulars of this device. Given the large number of clickable commands in each notebook, I sure wish the “send” commands were included among them. And, I sure wish there was more visual feedback coming from the desktop software, where character counts are not limited, as they are on the pen. One more not-wild-about-it: the pen’s tip should be covered when not in use, but the small plastic cover is small, slick, easy to use. Hopefully, a future pen design will erase this concern. Still, this is an impressive step forward in the history of pens (seriously, this is how progress looks). As the LiveScribe community grows–and it is growing steadily–the design inefficiencies will become non-issues. It’s interesting that this is, in essence, a paper-and-pen product, a kind of enhanced notebook system, as opposed to a fully digital solution. It’s nice to be able to take notes in a notebook, to use a pen on paper, and to know that there’s some technology to enhance the experience, and to transfer all of it to a computer for storage or sharing. It’s old-school in its way, but when you get the system working properly and you use it every day (so that the commands become natural, not tedious steps along the way), LiveScribe is an impressive product indeed.